Here we go with Week 3 of my Project Life. Lot of sickies hanging around still, basketball tournament all week long and just life around the house. 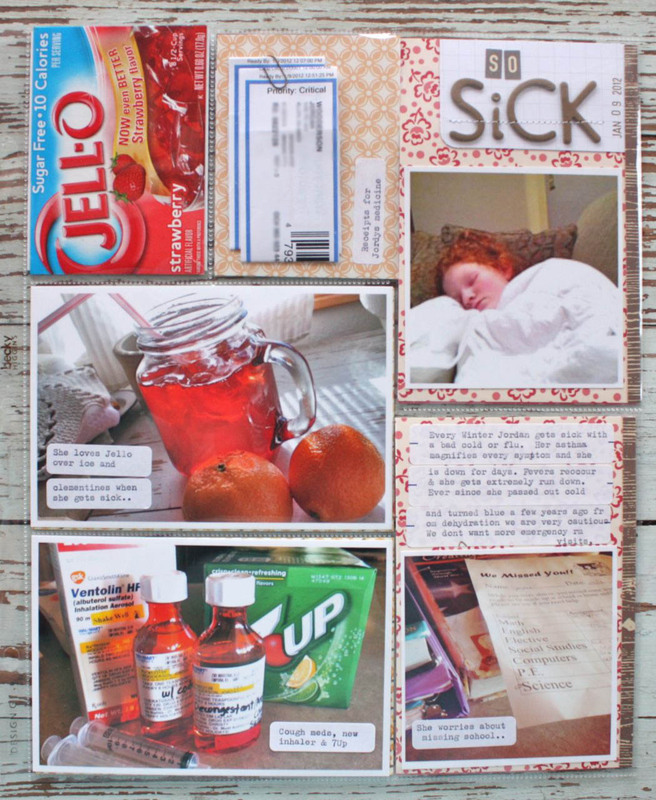 Lots of cheery color + white this week which was inspired by the journaling cards I chose from both the Clementine and Cobalt Project Life Core Kits. I also picked up some pads from Target which had some really fun, fruity colors that you can see in my PIP post for this week. 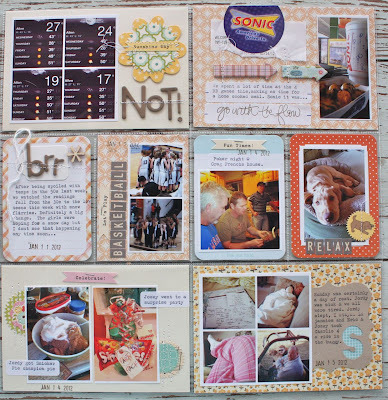 I did meet my goals of keeping my embellishments flat this week + I used more 4 x 6 photos. 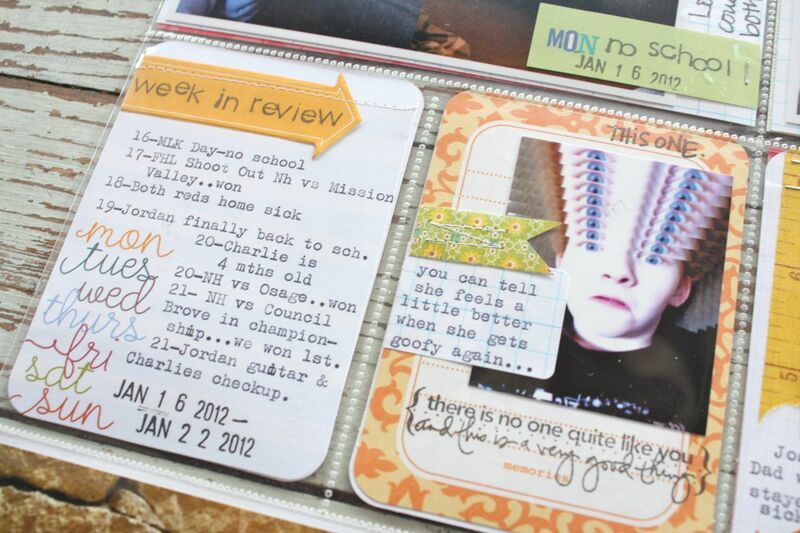 I also used a week in review card + made some of my own label embellishments. Here's the insert cards, starting on the left side. 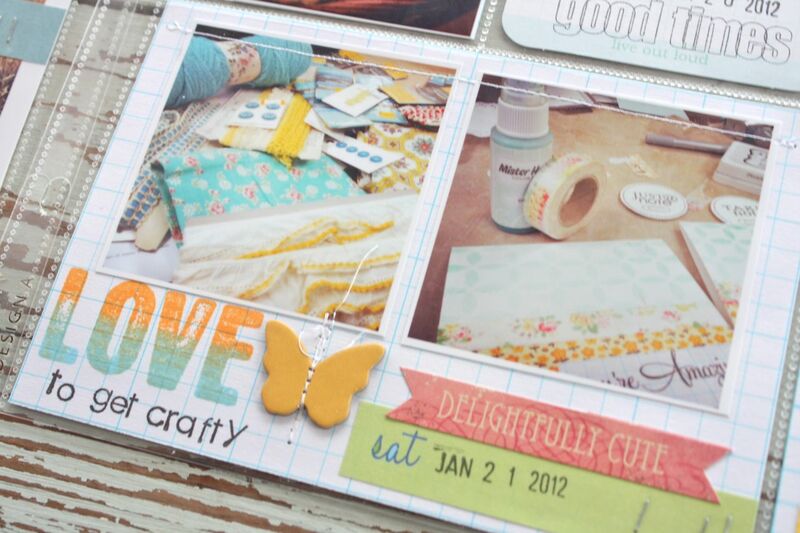 This first card is my week in review which features a sticky note from Studio Calico. The right card features a goofy photo of Jordy along with an Ali Edward stamp + Basic Grey snippet of patterned paper + a grid label sticker that I made. 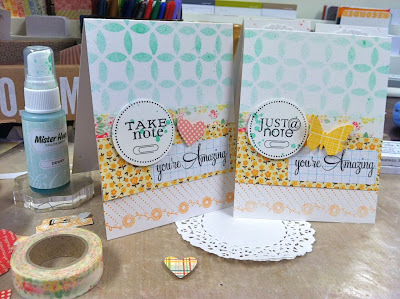 Here I used a card from the Cobalt kit on the left + a card from Marcy Penner's shop on the right. I got out my Hero Arts wood mini alphabets to create some of my journaling this week. Stickers were used for the numbers. Here I had 2 Instagram photos on the left....one sticks out of the pocket because I didn't want to trim it down. 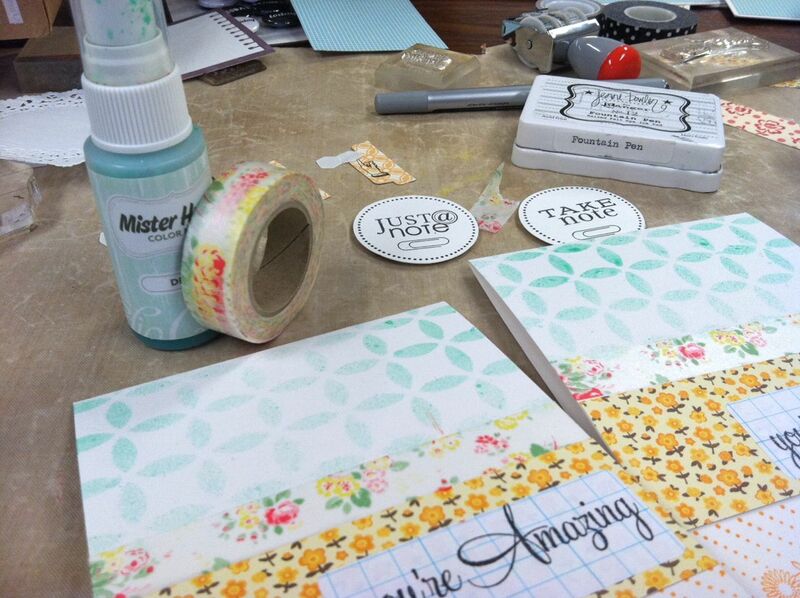 On the right I used my typewriter for journaling + an Ali Edwards stamp. Here I have a small Instagram + Diptic photo on the right + another small photo on the right. 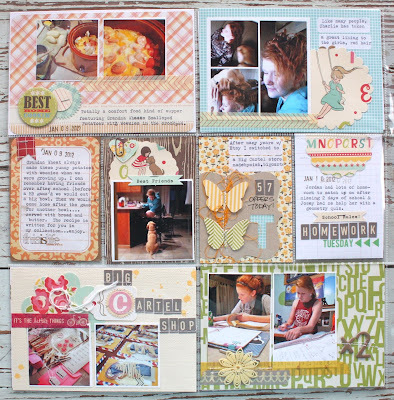 I also used more of the Hero Arts letter stamps.....I think they add such a homespun feel to projects. 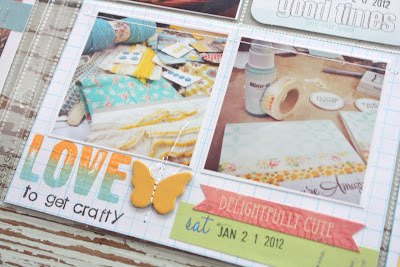 And here's a 4 x 6 photo that has added embellishments of my small tags + grid label + sticker. I love how these simply add-ons really help tell the story. 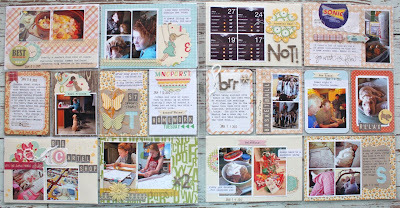 My favorite 4 x 6 slot this week features 2 square photos + stamped images + Studio Calico chipboard butterfly + a sticker. 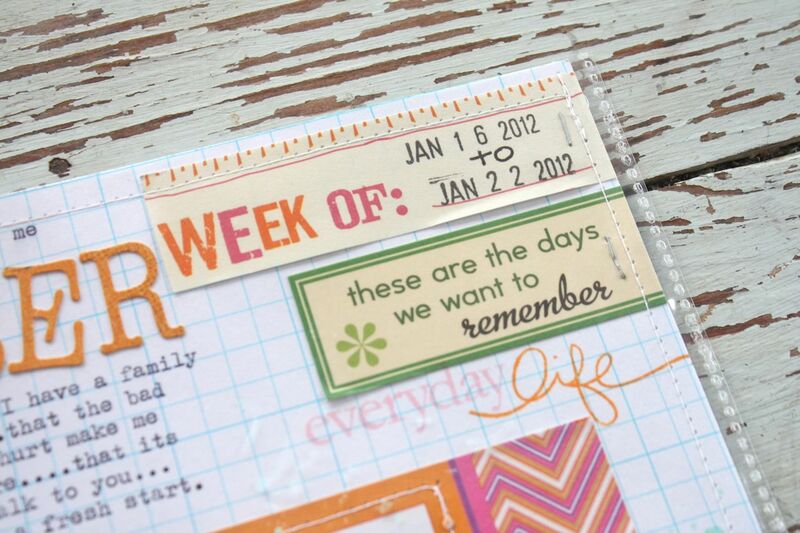 On each 4 x 6 insert I trimmed down a day of the week from the notepad from Target. 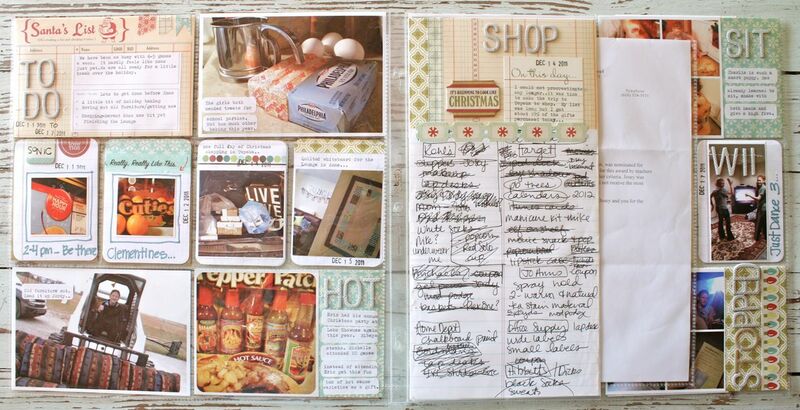 Love how that worked out and will probably use it more since I have an entire notepad....from the $1 spot! 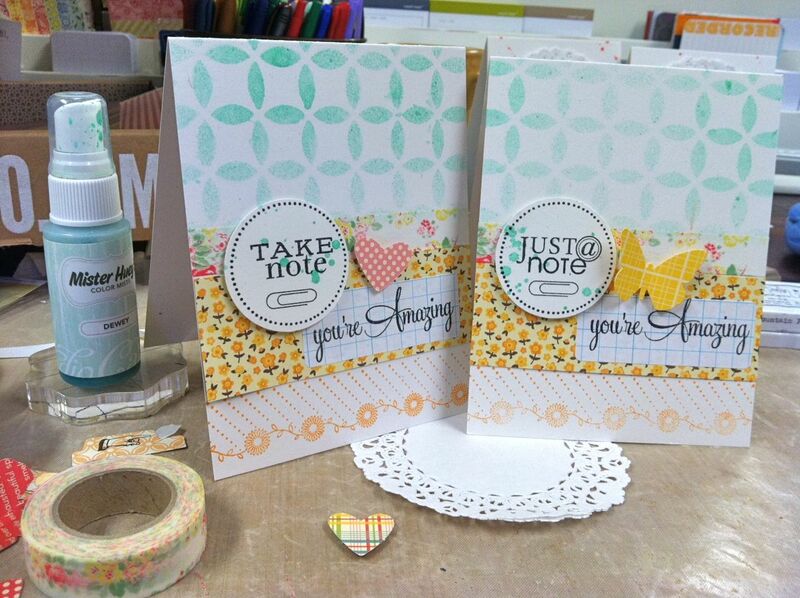 For the 2 tone looking word *love* I used Ali's stamp and 2 ink pad colors. 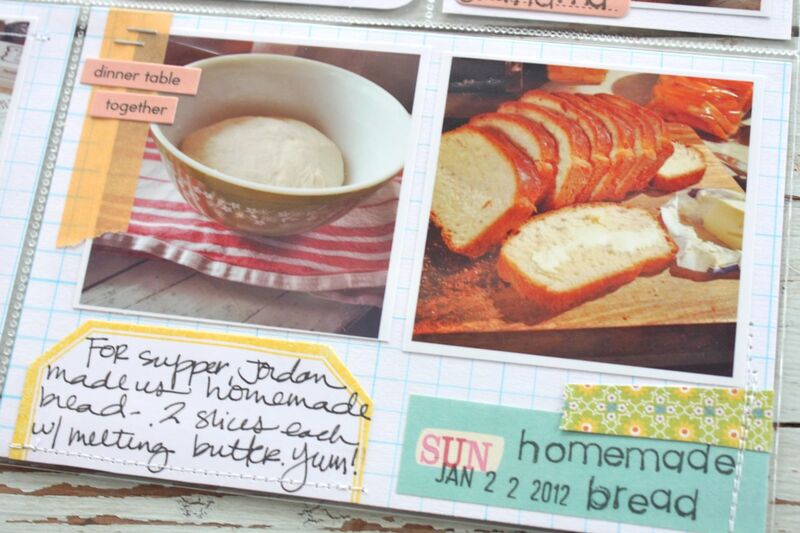 Here's Jordan's homemade bread, the before and after shots. I also used a handmade label using my Label Basics set. 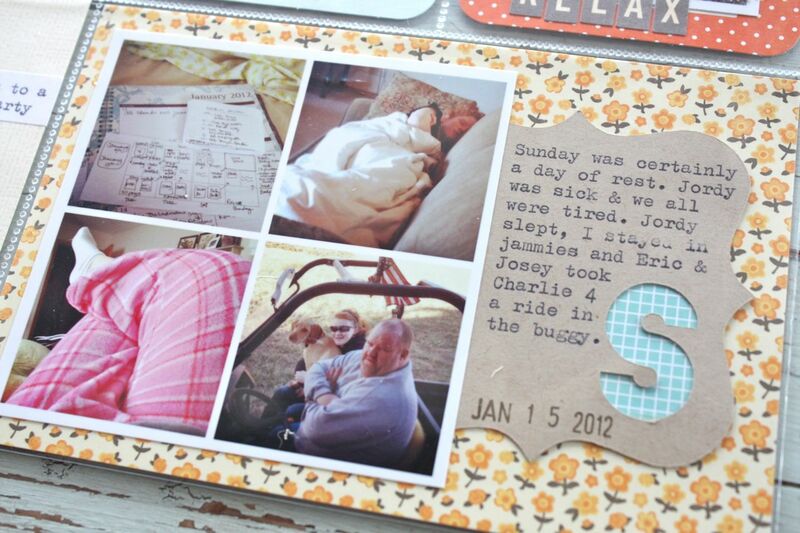 A little Washi tape, a tiny staple + small stickers finish off the photos. I also had an insert page this week. You can see how that looks with the main pages below. I like to keep all of my inserts smaller than the 12 x 12 main pages. Using another sticky notepad I got from Target, I used a sheet as a base for some extra square, Instagram photos. 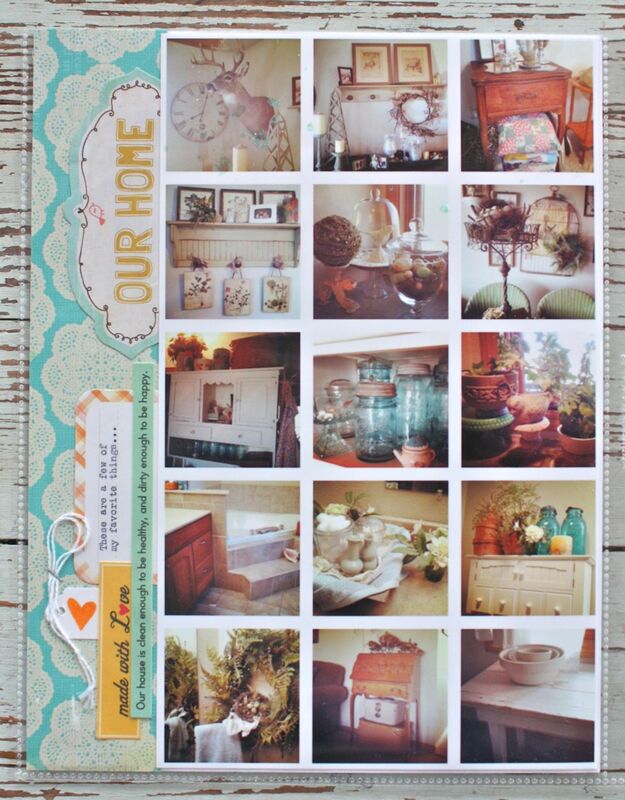 I used each photo to prompt some journaling about how Project Life helps me remember the important things in my life. The top corner with a sticker and a cut out portion of a notepad sheet. I also added in some Ali Edwards stamps. And the backside of my 8.5 x 11 insert. I used my iPhone to take lots of photos around the house. I turned them all into Instagrams and created a giant index sheet of sorts. Love how I could fit 15 photos on one page. Will definitely be using this strategy again. Thinking it will be great for photos of Charlie at each month of his first year. Tip: Think extra birthday photos, sporting events, projects you take photos of, your kids, vacation photos, photo booth shoots, meals, etc. Lots of ideas brewing here. Note: I printed this collage at home...simply emailed my photos to the big computer and printed them using the settings on my printer. No other editing programs involved. Here's my embellished edge. Lots of stickers + a stamped tag from my shop + a portion of a Clementine journaling card that I ran through my typewriter. And another week is in the books. I'm feeling great about getting my insert pages done at the same time of the weekly pages. I'm finding the inserts are nice for those extra stories I want to tell. Stay tuned for next week's Project Life....I'll be using items from my Take Note Kit. Off to another ballgame tonight. Josey will be sitting out this game as she's recovering from her bang to the head. Tomorrow we might be heading to the movies, doing a little shopping for dress shoes for dances and who knows what else. Looking forward to a nice relaxing weekend, that's for sure. How about you? How are your Project Life pages going? Edited for questions: My card sizes today are A2, half sheet of 8.5 x 11 cardstock. Back today with some cards I made from my the leftover products from my last week of Project Life. Just a nice handful to add to my stash. Both sets of cards use Take Note for the circle focal point piece. 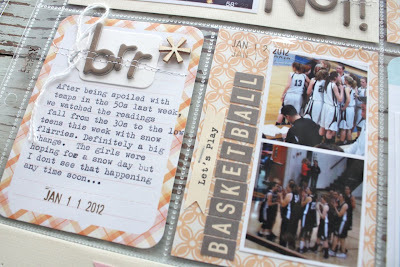 The base cardstock for all cards is Rustic White. I used Dainty Doilies on these first cards under the layered embellishments. From my stash of Project Life leftovers I used some October Afternoon Flower Sack elements, Washi Tape, and patterned paper. 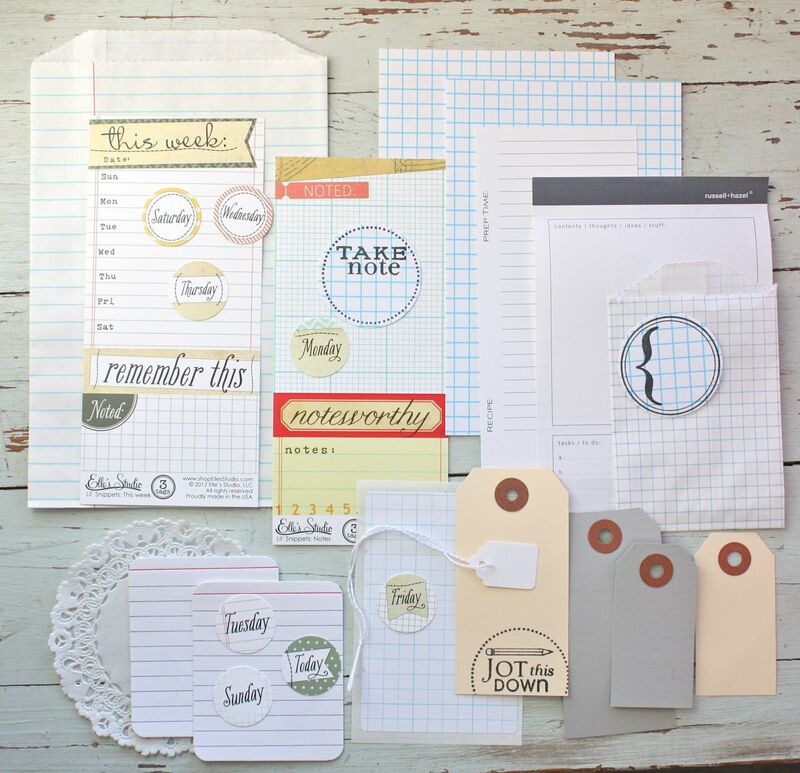 Lately I've been using these grid labels on my Project Life pages for journaling. They've come in really handy so I thought I would use them on my cards today too. 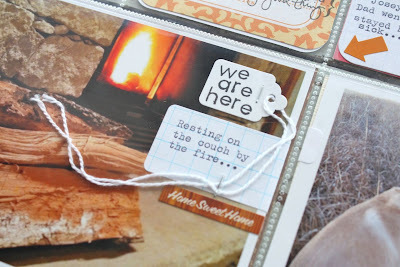 Here I stamped my sentiment from Tag-its #12 twice and then cut the label in half. I used half a label on each card for an added embellishment at the bottom. 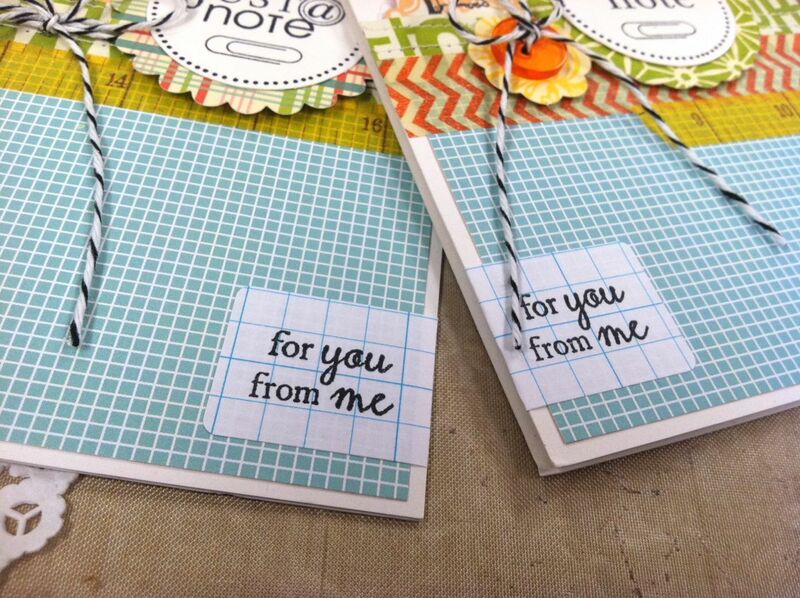 I love using grid & graph papers lately so this adds a fun twist. Look for these labels in a new shop kit hopefully coming this week. I also had fun using my new file folder label punch from Jenni Bowlin. Perfect for all of us office supply lovers! My next set of cards also uses Take Note + I added a sentiment from Script Sentiments. The heart and butterfly accents are more of the OA Flower Sack embellishments. The stamp at the bottom is an old, old Stampin' Up! stamp. I also had fun using my Studio Calico mask & Mister Huey spray ink on these cards. A strip of Washi tape adds a fun layer to my cards without adding a lot of bulk. This floral tape is from 2Peas. 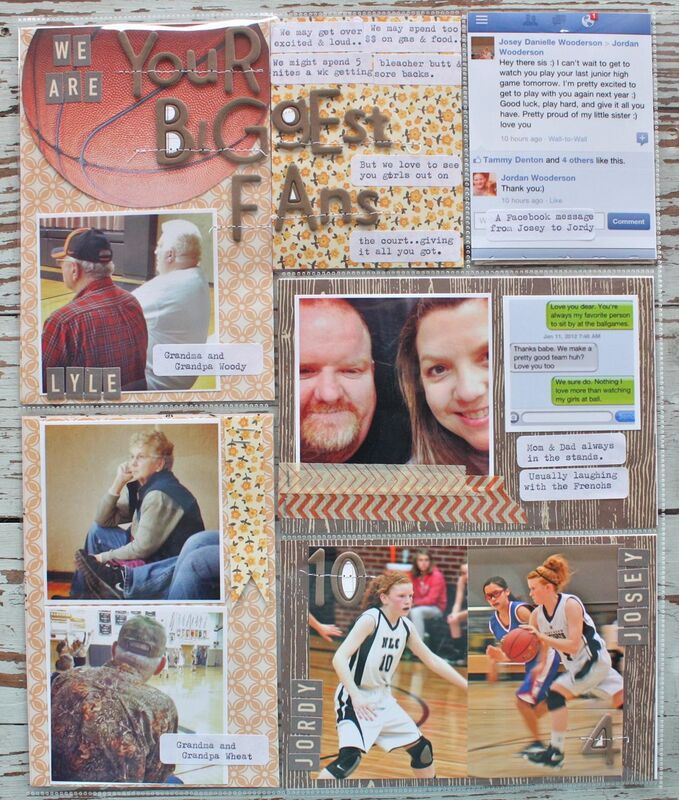 Finishing up a Project Life insert for Week 4, working on some fun kits for the shop.....and dealing with my Josey girl who got a mild concussion at this week's basketball game. We took her in to get checked out yesterday and all is okay. A lingering headache is her biggest symptom. Man, it feels like forever since I've had a full day to work. Heading there right now. Have a great day everyone! It's PIP Day for Week 3 of Project Life. Can you believe that January is almost over? 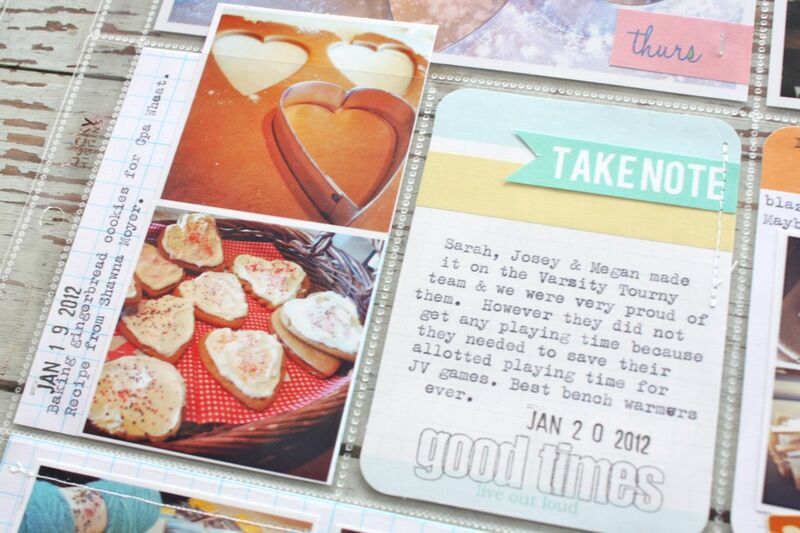 If you've been keeping up with your Project Life you can now see the photos turning into pages. Isn't it wonderful to see your album filling up? These are the days. 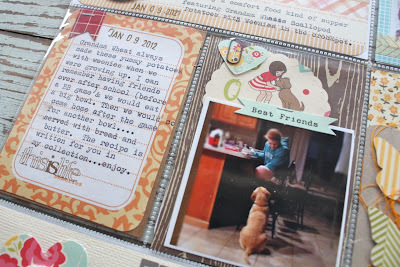 Here's a shot of this week's Project Life in Progress. First thing you might notice is the rainbow sherbet color palette. I'm loving a little more white + some fresh color for the new year. 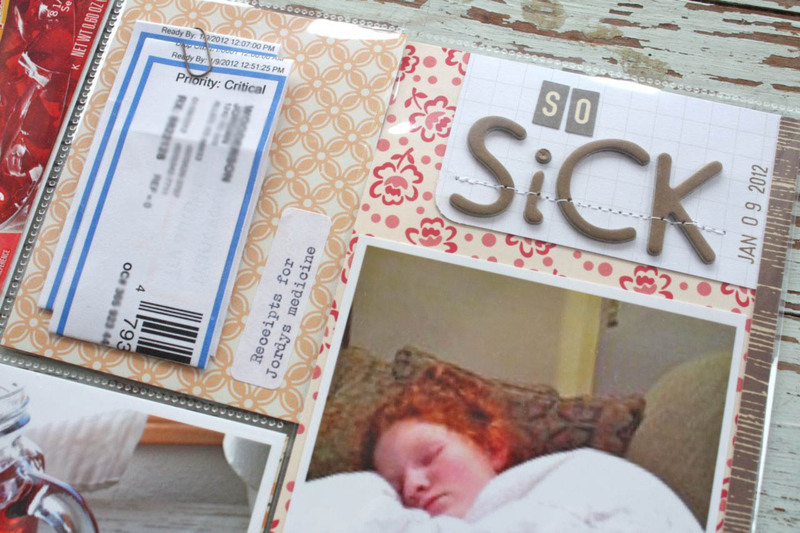 I worked last night while watching tv on getting all my journaling cards in place + gathering a fun pile of embellishments. 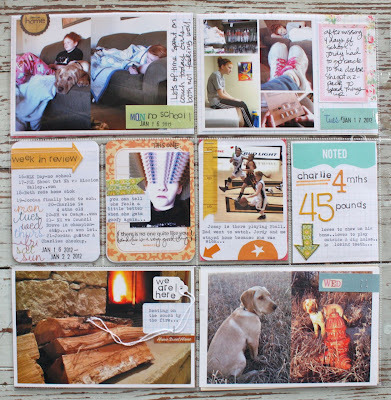 This week I mixed journaling cards from Marcy Penner's shop with cards from the Clementine & Cobalt Project Life Core Kits. From my stash I pulled several stamp sets including my Label Basics from Papertrey + some Ali Edwards stamps. I also pulled some fun Washi tape, Basic Grey 6 x6 paper pad, and some printed grid paper + grid labels(my printer has a feature that allows me to print grid + notebook paper, so fun). 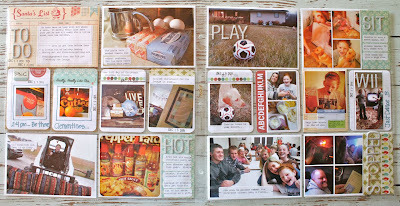 The fun days of the week pads are from Target, some happy little finds that made their way home with me. 1. Keep my embellishments fairly flat. I'm really trying to keep my albums down to 2 like I did for 2011. 2. Use a week in review insert. 3. Use more 4 x 6 photos. 4. Make my own stamped labels. I'm finding that I have a lot more photos lately. It will be interesting to see if this continues or perhaps we're just particularly busy right now. 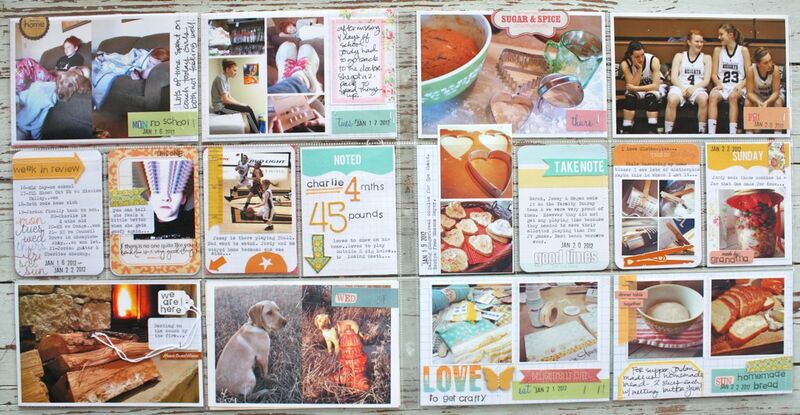 I'm definitely having to plan my pages when I have the extra photos. I don't like to have extra photos sitting around so I just print what I need for my album. On the flip side, sometimes you don't have enough photos for week. 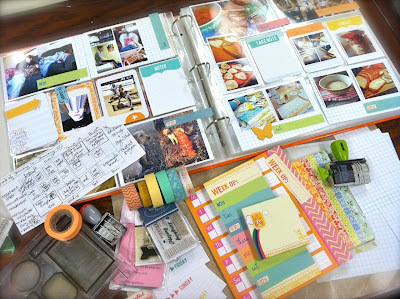 Check out Jennifer Hufford's Project Life week over at Elle's Studio to see how she makes up for a lack of photos this week. This week's inspiration comes from 2 great blogs I found. First is Ann-Marie Morris. 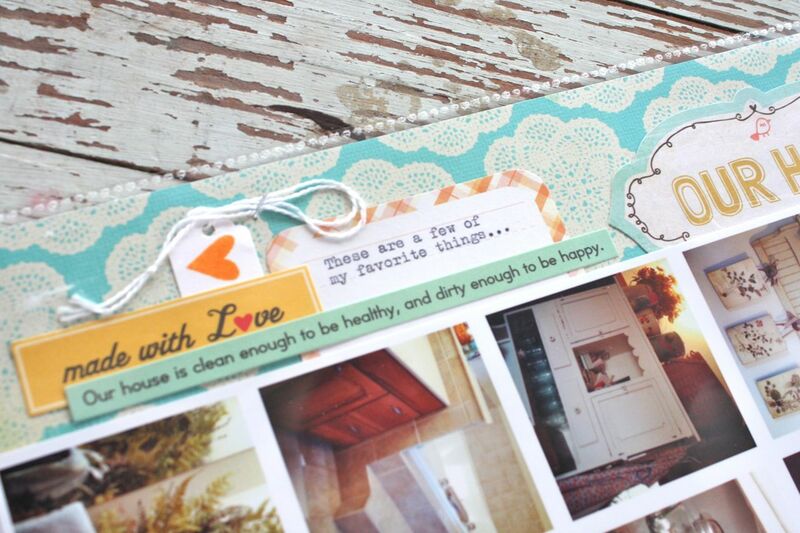 Her pages are full of color, fun embellishments, lots of photos and great insert pages. Leena Loh's blog is another blog full of eye candy. I immediately fell in love with her beautiful Instagram blog header and was very happy to find this inspiring page of Instagrams. I just took a bunch of household photos and will definitely be using this for inspiration for a fun collage page. Leena's PL pages are full of fun photos, beautiful finishing touches that seem so simple but perfect, lots of hand journaling and good use of white space. Thanks for the inspiration ladies! 1. I'd love if some week you could explain what sizes you choose for your pictures, since I noticed you used all small ones this week. The sizes of photos I use all depends on how many photos I need to squeeze into that particular week. If I only have one photo for a day then it's usually a 4 x 6. If there are two photos I usually turn them into Instagram squares or smaller rectangles that fit into (1)4x6 slot. If there are even more photos for a day I will start fitting them into the 3 x 4 slots. The more photos I have, the more I really have to plan my weekly layout. 2. How do you photograph your spreads? I'm struggling to get good photos of mine. I have a bench that sits right below 5 windows in my dining room. I photograph all of my layouts on that bench usually around mid-day when I have soft, natural light shining through. I scoot my table around if there happens to be any glare which can pose issues with the shiny page protectors. Natural lighting is your best friend. 3. 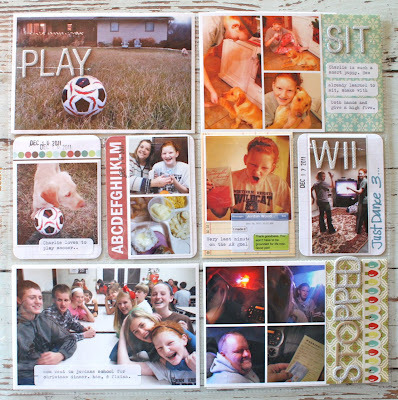 How do you print the smaller photos you put in your 4x6 slots? Do you use a certain computer program? For any square photos I use Instagram on my iPhone. You can see this post for tips. I print all my photos at home using my Epson Artisan 730 printer. 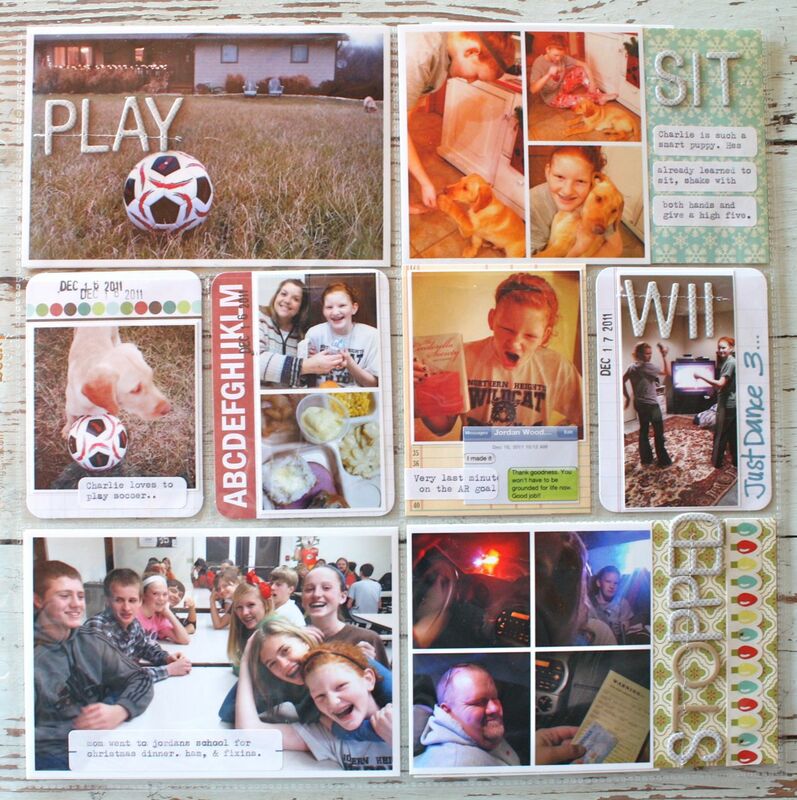 It has a great program for printing multiple photos on one sheet. I can customize the photos sizes to be whatever size I want. No Photoshop needed. 4. May I ask which photo album pockets it is you are using? 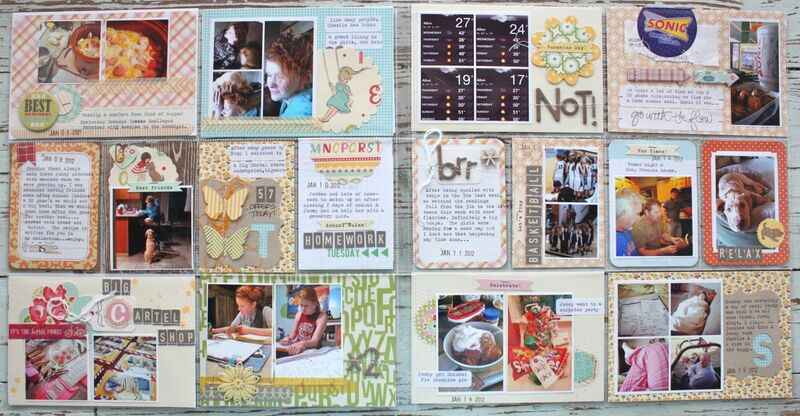 I use Project Life's Design A Pocket Pages with an assortment of the other page protectors mixed in for insert pages. 5. I was wondering if you could discuss the process of getting your phone pics to your computer how you print them. How do you get them to have the white border like Polaroid pics or are those usually Instax pics. Can you make your iPhone pics look like Instax when you print them? This blog post is a good resource for your questions. For the white borders on my photos, I have a setting on my printer that allows for borders. 6. What kind of camera do you use? I am using a Canon Rebel XSI and I have an old Tamron zoom lens too. A lot of my photos lately are taken with my iPhone too, it's sooo handy vs. the big camera. 7. Will the area where the title page has chipboard letters get bulky? How does your nearly complete 2011 album(s)look? I'm worried that that corner of the album will start to get huge and puffy. I ended up using (2)12 x 12 binders for my 2011 Project Life pages + insert pages. They are pretty full so I'm paying close attention to my use of dimensional embellishments this year. I'd like to keep 2012 to 2 albums also. 8. I am curious about your vintage typewriter and wonder if it is manual or electric? My manual typewriter is a pretty little gem from Good Will. I paid less than $15 bucks for it and had to re-thread a new ribbon (from Staples) onto it's existing spools. I use it each week as my hand journaling is rather large and loopy and takes up a lot of space. 9.I'm curious where you got the letters you are using to spell out words. Those are chipboard letters which can be purchased at most stores that sell scrapbooking supplies. 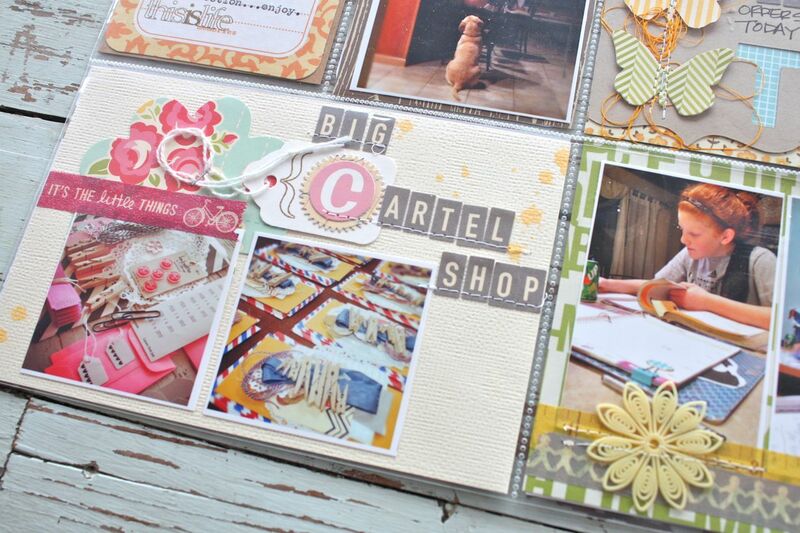 Most of the ones I've used lately come in the main kit from Studio Calico each month with my paid subscription. 10. I have noticed that when I turn my pages the cards are falling out, how do you stop your album from falling out everywhere? Hmm, I'm not having these issues with my Design A Page Pockets. Not sure if that's what you're using. For any pockets that have the opening on the side instead of on top, there is a little movement. I simply add a little sticky dot to keep photos in place. 11. Are you able to share money saving tips on starting PL and how to maintain the project without spending too much money? There are several options. You will definitely need some sort of page protectors. Lots of options from Project Life. 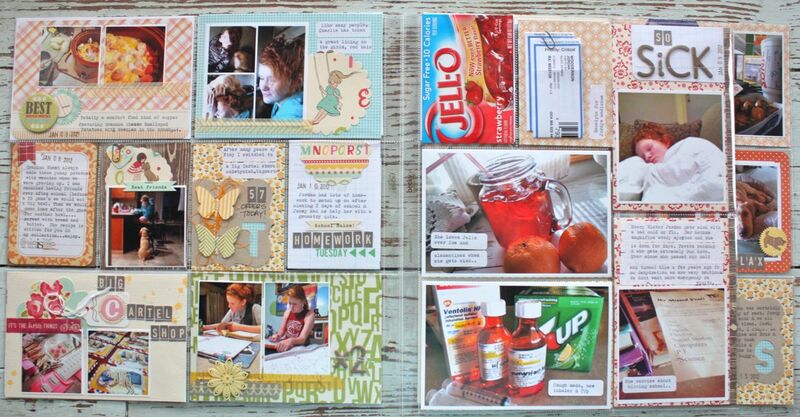 From there you can use your existing supplies to create journaling cards, etc. If affordable, the Project Life Core Kits are great if you want to add in a year's worth of journaling card inserts. 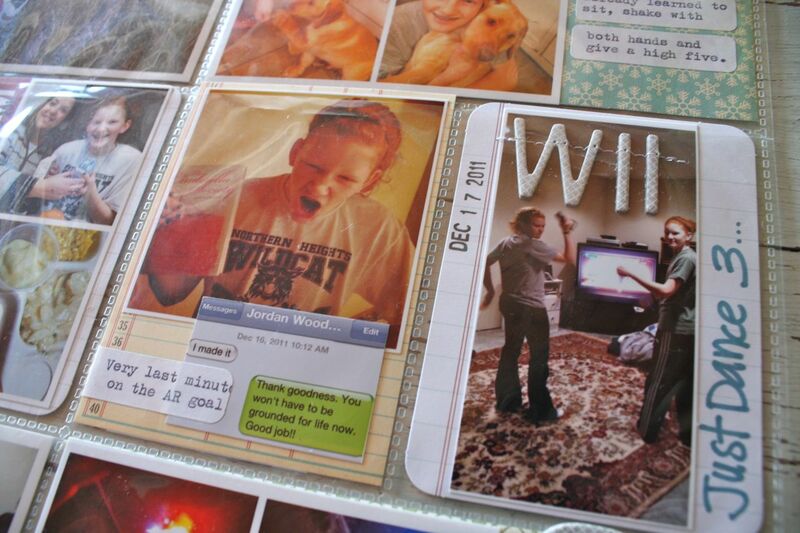 For this, all you would need is to just add photos + journaling to page protectors. The rest of the embellishments are fun but not necessary if you looking for simple, easy and affordable. The girls are all better and back in school. Both basketball tournaments are over so it's a tiny bit less hectic than usual this week. I'm working on some fun new vintage kits for the shop + I'll be posting some cards I made using leftovers from Week 2 of Project Life. 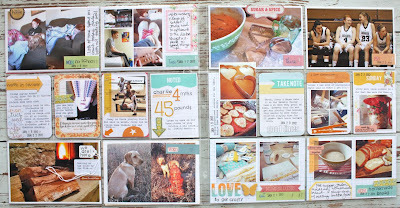 My Project Life Week 3 will be up on the blog later this week also. Have a great day everyone! Happy Weekend to you! We have a busy day planned so I have to type fast to sneak in this blog post. Josey's BB team is playing in the championship game tonight in their league tournament. Go Lady Cats!! 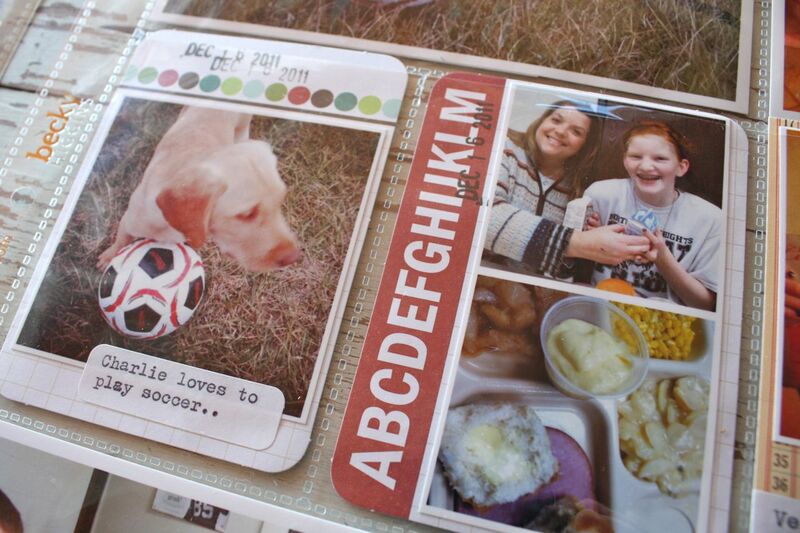 But for now I can't wait to share my Week 2 of Project Life with you. It's my favorite week to date. In my Week 2 PIP (Project Life in Progress) post I challenged myself to use mostly items from a Studio Calico kit + make cards with the leftovers. The cards are coming soon and I did use mostly SC kit items. 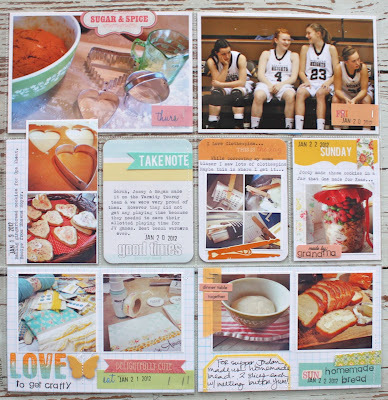 I got totally scrappy and treated each insert as a mini scrapbook page. My spread is very mixy matchy but I think overall it blends together pretty well. I'm also very excited because I completed my insert pages in the same week that I got the 2 page spread done. I have lots of incomplete insert pages for 2011 because I thought I would go back and scrap those pages in the traditional method. Not gonna happen probably. I used divided page protectors this time and got my inserts done so much more easily. You'll see those at the end of my post. Here's the left side of my Week 2 layout. I had so many photos this week that I to bypass my main, dated insert and the week in review insert. Those extra slots come in really handy when you have excess photos you want to use. I also didn't use one single 4 x 6 photo this week. I love the slots filled with those big photos but there was just too much to record this week. There were tournaments, a party for Josey, card night for Eric, homework, lots of traveling, lots of sickies at our house + just lots of photos that I captured. 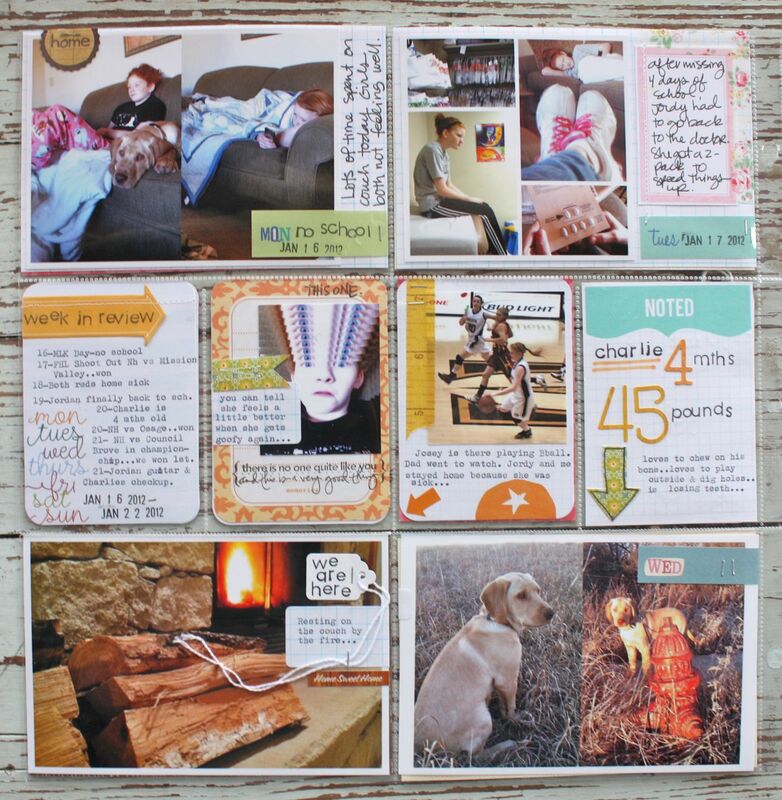 Here's shots from my 3 x 4 journaling inserts. I used a PL Clementine card on the left with typewriter journaling + an Ali Edwards stamp set from Technique Tuesday called It's OK. 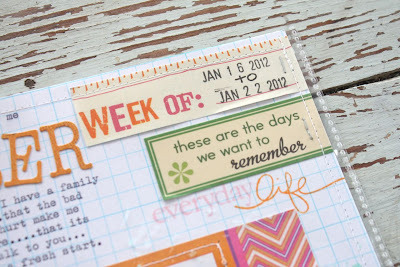 I used this stamp set several times this month. 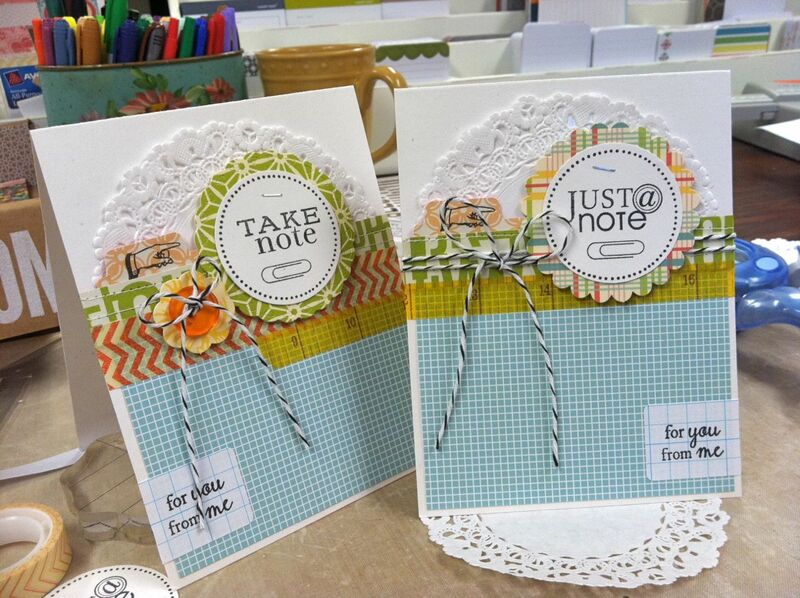 On the right I used patterned paper from Studio Calico's January County Fair kit. It was fun to just reach into this box knowing that I had a nice selection of items to choose from. Easy thinking. I also used some October Afternoon Flower Sack die cuts that I ordered from SC last month also. The little dog and girl was perfect for this photo of Josey and Charlie. The best friends banner was from that Flower Sack collection too and I used several these as an ongoing theme for my inserts this month. Here I used a die cut from the kit from Ormolu. I backed it with grid patterned paper + added butterfly die cuts from the OA Flower Sack collection. The small alphabet also came in the SC kit and is from October Afternoon. It's nice to use pick 1 small alpha + 1 chipboard alpha and use those to tie everything together for my pages. Behind the butterflies I added a wadding of string and then stitched down the center of the butterflies with my sewing machine. The right uses more Flower Sack accents + alpha stickers. You'll see lots of typed label journaling on my pages today. 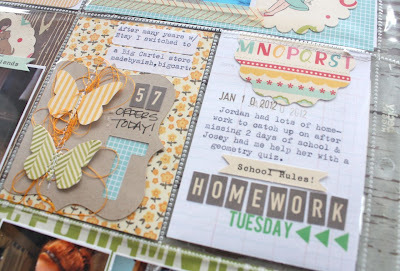 The journaling card with "Tuesday" on it is from Marcy Penner's shop. Here I used another Clementine journaling card + the coordinating patterned paper from this kit on the right. 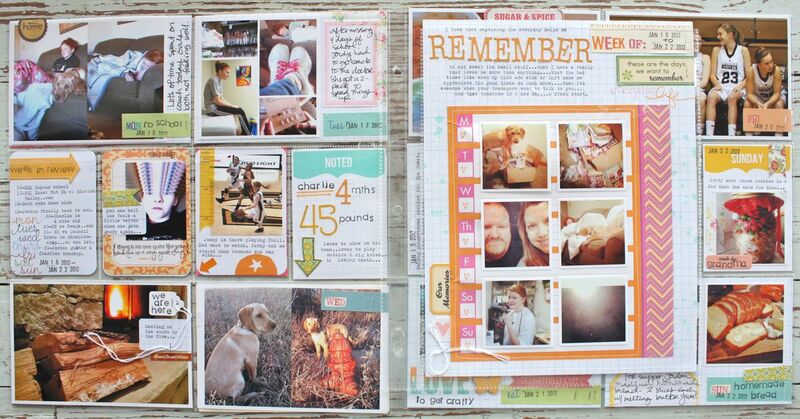 I love the light and airy feel of the Clementine kit and I'm noticing the look in my last few weekly layouts. 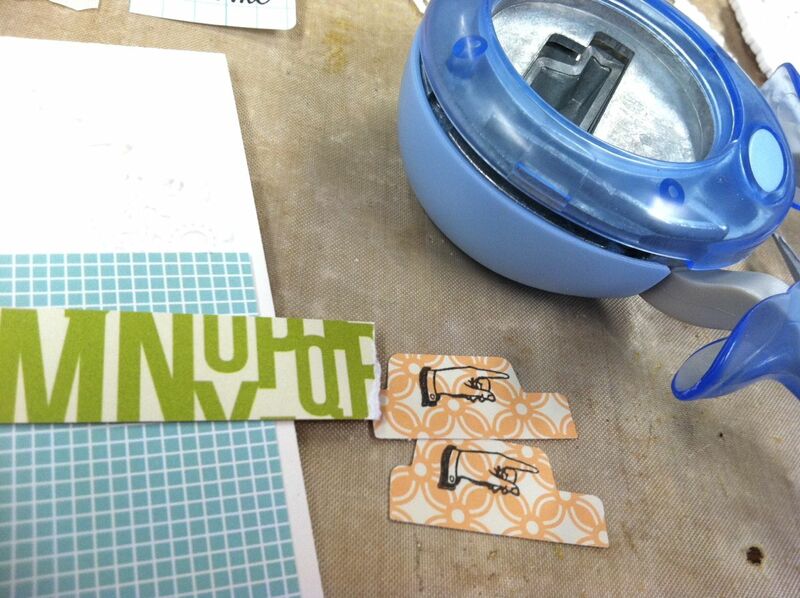 On the left I used a white tag from my shop as a base for some chipboard letters that I stitched on. On the right I used small photos + an OA banner + alpha stickers. Don't forget the date stamp. Love to add that to each insert. 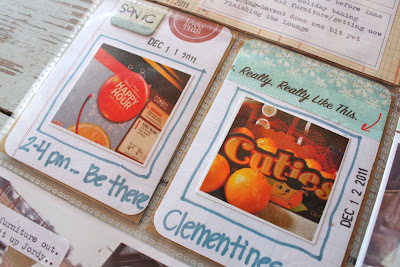 Here I used 2 Clementine journaling cards that have photos on them. The OA Flower Sack puppy accent was just perfect for this photo of Charlie. 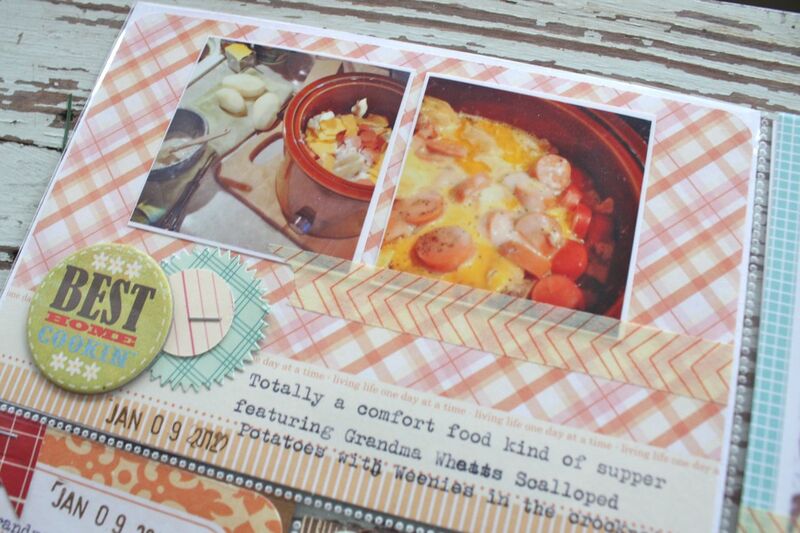 And now on to the 4 x 6 inserts.Here I used a Clementine piece that has photos of my mama's famous scalloped potatoes. Does potatoes have an E? Well it does in my pages, ha. I used some Washi tape, OA accents and a chipboard piece from the SC kit from Basic Grey I believe. Funny how so many of those accents worked perfectly with my photos this week. Here I got really scrappy with an insert that features some kit items from my new Big Cartel shop. I challenged myself to find a use for the "C" circle accent from the OA Flower Sack pieces. I added it to another white tag from my shop + a bracket from Ali's It's OK stamp set + small alpha letters. Love that Jenni Bowlin plastic flower you see on the right. That was a kit item too. 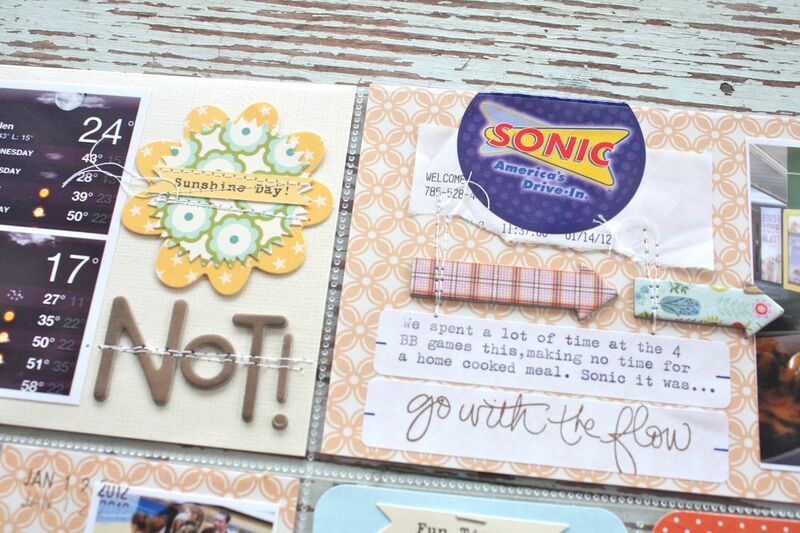 More kit items + a sticker that came on a Sonic bag + a stamp from Ali's It's OK set. Here I used 2 photos that both have a "celebration" theme. More OA accents + typed sticker labels. I think those are becoming a mainstay on my pages. Must keep them on hand. I used an Instagram photo here along with an Ormolu die cut from the kit. I typed right on these die cuts. 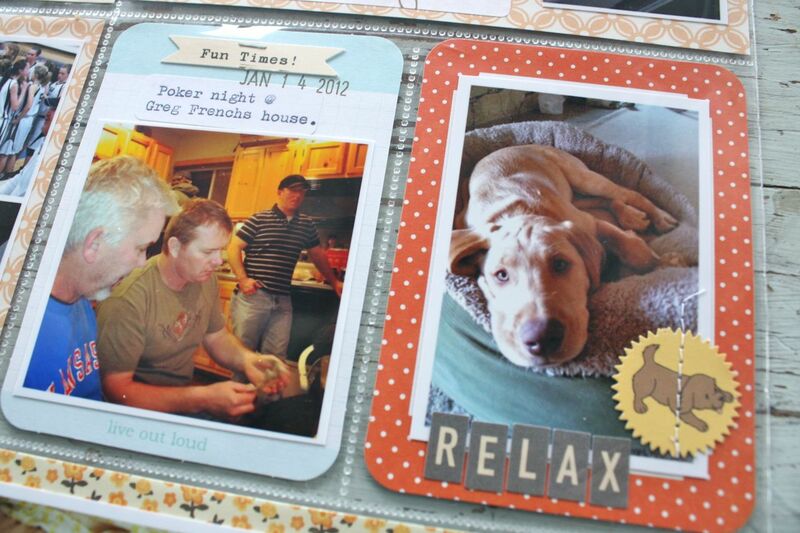 And here's my 2 page spread shown with my insert page. 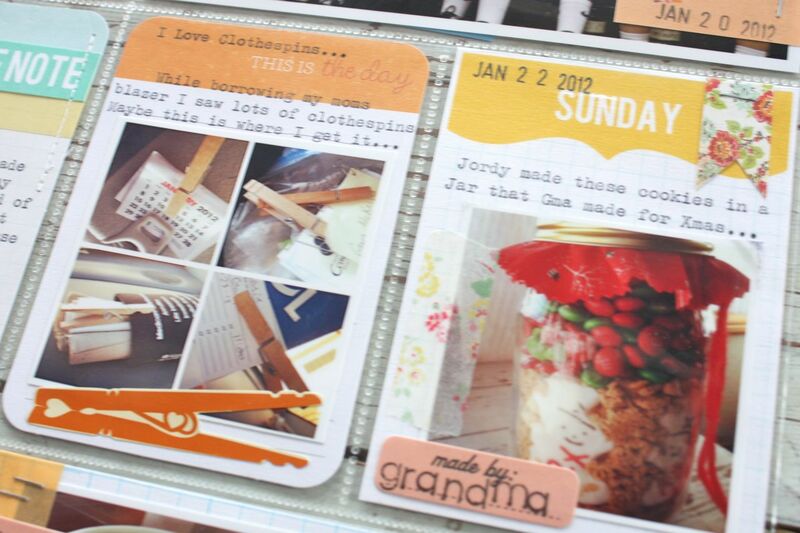 I used a Project Life Design G Pocket Page which will available sometime in February. I like all my insert pages to be smaller than a 12 x 12 size so that the main weekly pages can be seen. Our little Jordy gets sick every year and has a hard time shaking it. With her asthma, every cold or flu symptom gets magnified and it's a big deal. She was down for nearly 2 weeks and is just now feeling better. It's an event that I wanted to document on it's own. I saved a Jell-O box and some prescription pieces for memorabilia. Lots of label stickers with typing for journaling. My handwriting is just too big and loopy for the small amount of space I had. I used more papers from the SC kit + a few from the Clementine collection + the same alphabet letters that I used on the weekly pages. 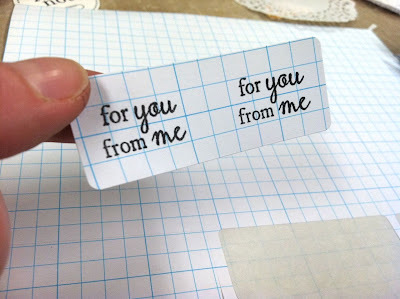 A blank grid card from Project Life is a perfect backdrop for lettering. Here's the back side of that insert page. We've been to so many games this year and the traveling and coordinating times with having one red in grade school + one red in high school has really kept us busy this year. I wanted to make a special page that shows the girls' biggest fans and how we love going to their ballgames. 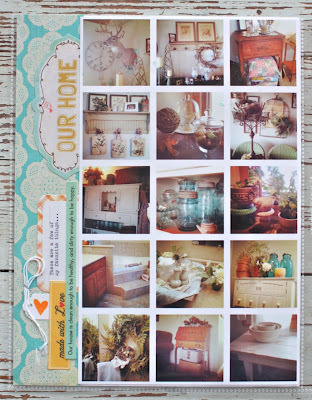 I really love the insert pages because you can use one full page that focuses on one theme, therefore making it feel like more of a traditional scrapbooked page. I used 2 separate inserts for my chipboard stickers because I knew I couldn't fit it all onto one insert. When the inserts are added to the page protector the letters just flow from one insert to the other pretty seamlessly. 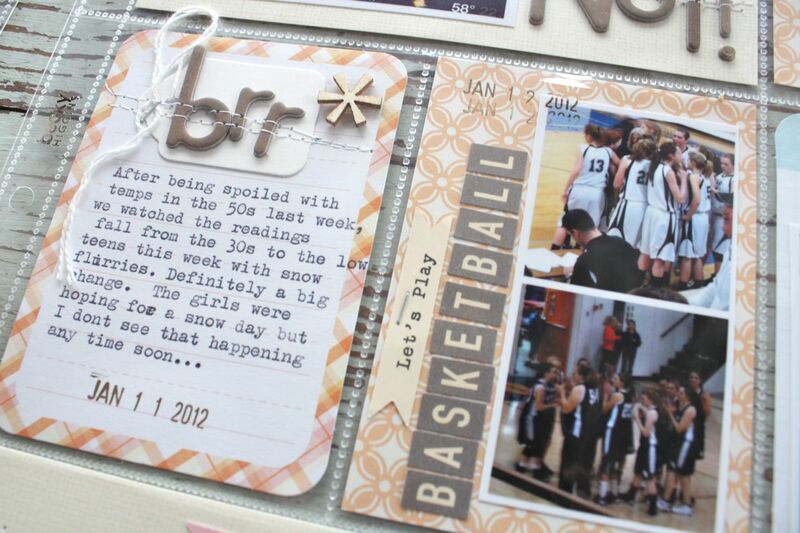 The basketball was hand cut from a larger sheet of patterned paper. 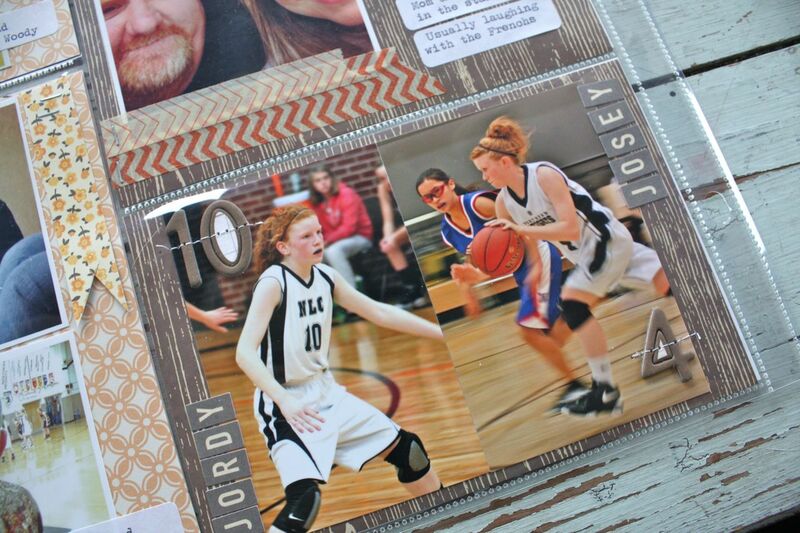 I used photos of all of us that attend the girls' games + a text message Josey sent to Jordan + these two photos of the girls in action. I like how it looks like Jordan is playing defense against Josey dribbling the ball. I happy little thing that was not really planned. I used sticker letters for their names + chipboard letters that were stitched to the photos. Love adding #'s to inserts whenever I can. Okey Doke. That's it for Week 2. Stay tuned Monday or Tuesday for my Week 3 PIP post + I'll be showing some of the cards I made using leftovers from my Week 2 product picks. 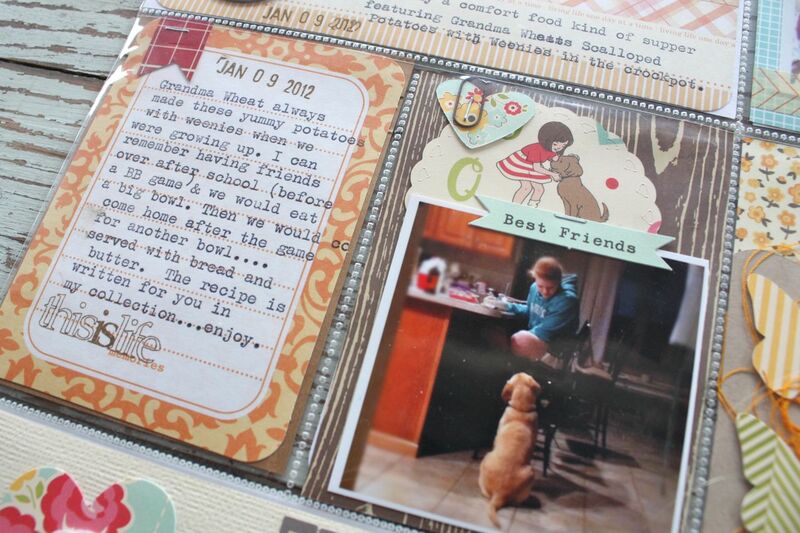 I love reading that Project Life has brought many of you back to scrapbooking. I'm right there with you! 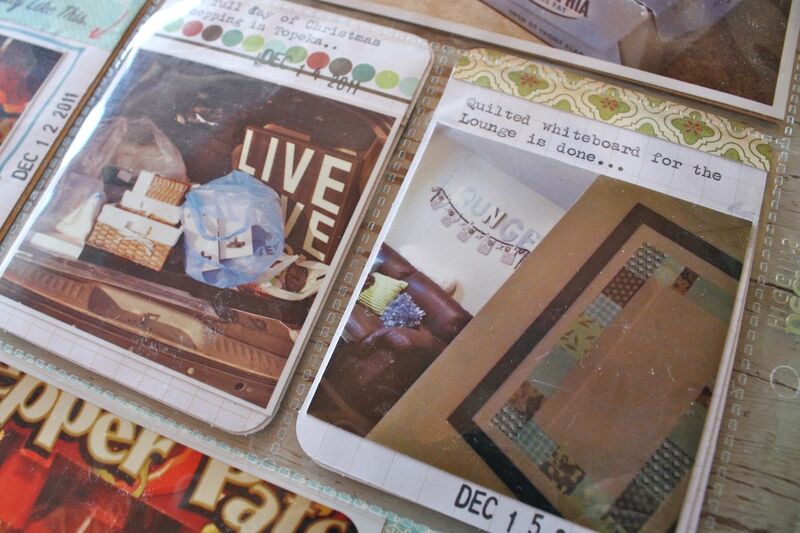 I know that I would never get as many photos scrapbooked the traditional way. Love that Project Life gave me a new option. I'll be answering your weekly questions in this post so be sure to leave a question in the comments section. I'm waiting on a few new products to come in as soon as some snow clears it's way for some delayed deliveries. I have a few styles of sacks left in the shop + lots of tags that are great for Project Life, cards and more. Look from some vintage kits coming too. I found a few little trinkets at my favorite thrift shop last week and they are cute! I have to go shut down Josey's marathon hot shower so that I can hop in myself. Then I gotta pump myself up for the big game tonight. Charlie will be home from his vet check soon too. Eric texted me that Charlie has bad gas today(just what you want to know) and really smelled up the vet's waiting room. Great. Now he's gonna be known as Smelly Dog from now on. Later friends! Enjoy your weekend. Hi there. Thank you so much for the nice feedback on yesterday's PIP feature. I think it's going to be a great addition to the blog that I hope you enjoy! 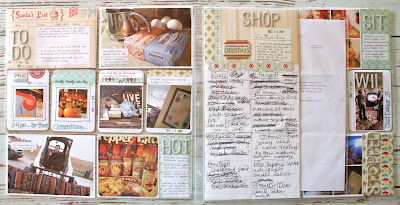 Today I have weekly Project Life from December 2011. You can visit Becky's blog to see my pages along with a few projects from the rest of the Creative Team. 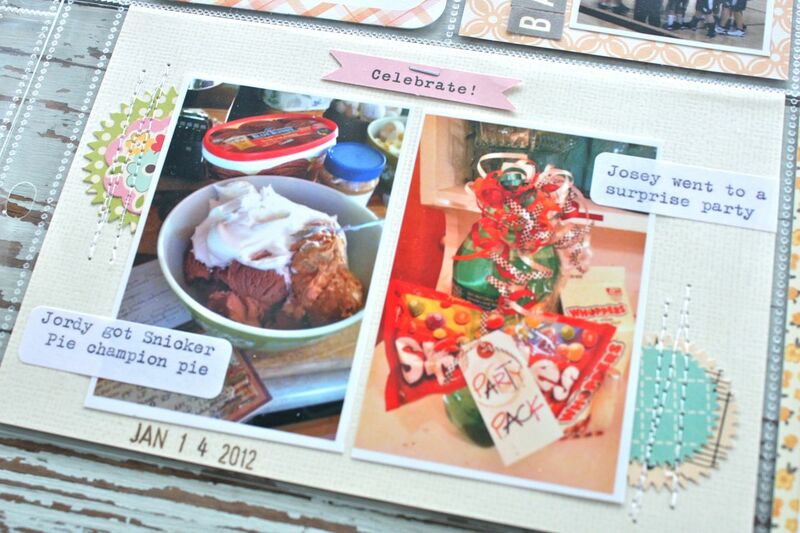 This is one of the few weeks from back in December where I actually completed the insert pages. For the rest I have the photos + sticky notes but they're not done. I have a goal for 2012 to complete those insert pages the same week I finish the actual weekly PL spread. I'll steadily go back and complete the inserts for 2011 as I get some spare time. I think it's so hard to go back and play catch up when you really want to be working on what's current. So here's my two page weekly spread without the inserts. I had a hard time figuring out if my December pages should look more holiday like or just go with the day to day happenings. I started my December Daily and was adding all the holiday stuff to that album....then realized that my December PL weeks looked very un-holiday like. I still have the last 2 weeks of December to catch up on so I know now that I want to add in some of those holiday happenings to my PL pages too. One of the things that I feel like I'm kind of finding a good groove with is setting the tone for each week now. By this I mean that I feel like my pages are looking more put together, a little more organized and that the 2 pages are balancing out more with the overall color and look. 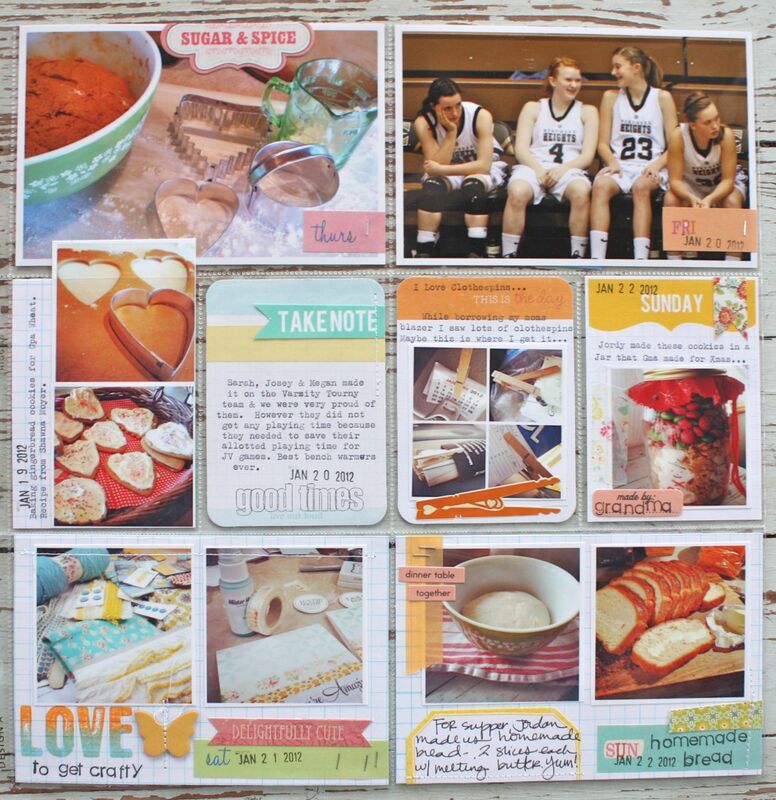 I like to think of each little space as it's own mini scrapbook page.....but yet have the entire 2 page layout look cohesive. Here's the left page of the spread. It was getting very close to Christmas and I hadn't done hardly any baking and NO shopping yet. 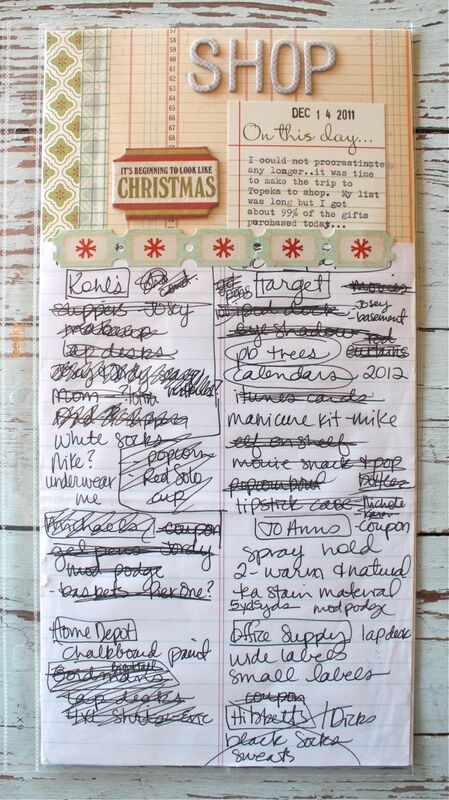 I had a big list with lots to do. We were also in the midst of finishing up the re-design of the girls' Lounge + I was sewing on quilts, and moving out old furniture. We were also heavy into basketball season, taking care of Charlie who looks so tiny in the photos and just living life. I love that my main, dated 4 x 6 insert really sets the theme for this week....lots to do. I did my week in review on this insert instead of in one of the 3 x 4 slots. The typed portion was done on a Russel + Hazel sticky note from 2Peas. Just a few snap shots which I outlined with my Bic Markits and added a stamped chipboard accent + Washi tape from the Smash Book line. Here I've got a photo showing the back of my Blazer packed with Christmas shopping items + a photo of the quilted whiteboard I made for the girls. I love this photo of Charlie that I captured with his soccer ball. He still loves to play with his ball every day so this will be a fun memory to reflect on down the road. On the right I've got a half of a Diptic photo that shows me at school with Jordan for her Christmas dinner day. Who wouldn't love to see what their school lunch looked like 20 years down the road? I get lots of look and sighs when I take photos like these out in public. I just smile and say *I'm a scrapbooker* and that seems to explain it all. The photo on the left shows yet another one of Jordan's goofy poses. She's holding her book that she finished just the day before her AR reading goal was due. She was quite the slacker this semester on her reading. I also included a small snippet of a texting session we had where she texted me that she made her goal. I love the text messages because they really capture conversations word for word. On the right the girls are getting their groove on with the Wii and Just Dance 3. I like to fill in these dark blank spots of photos with an embellishment like the stitched on chipboard letters I used...or a sticker or tag, etc. 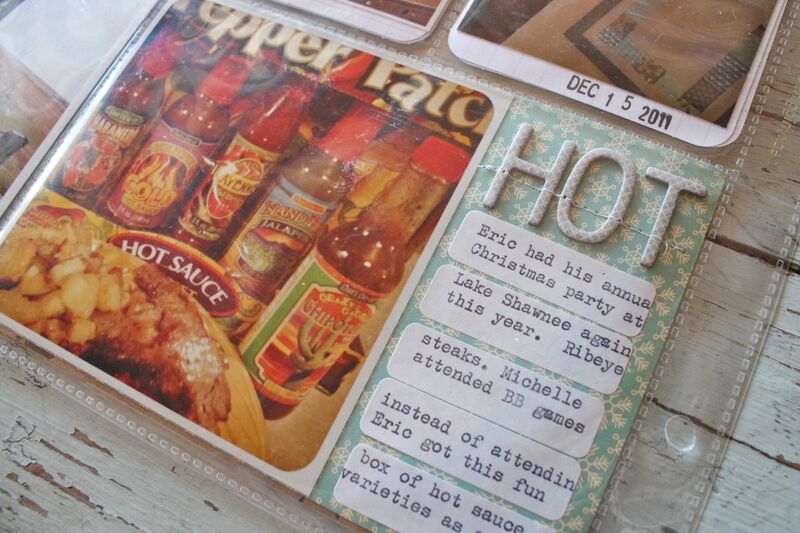 Here's a 4 x 6 insert using an Instgram photo of some hot sauce that Eric got at the gift exchange for work. He brought a big container of pub snack mix and the cheapest 6 pack of beer he could find. Duct taped it all together and go figure that it was the most stolen gift in the exchange that night. Too funny. I used lots of the small address labels for journaling...just ran the label sheet through my vintage typewriter. If you look at some of my other 4 x 6 slots you'll notice that I used lots of sticker labels there too. 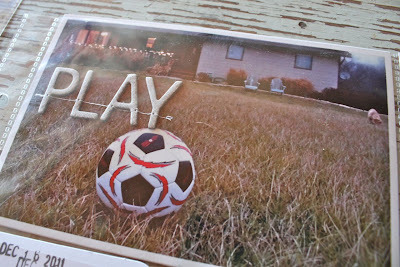 This is another 4 x 6 photo that coincides with the smaller insert of Charlie playing soccer. I love shots like this that capture something up close but then there's stuff in the background too. I can see Charlie and our house with Christmas lights. 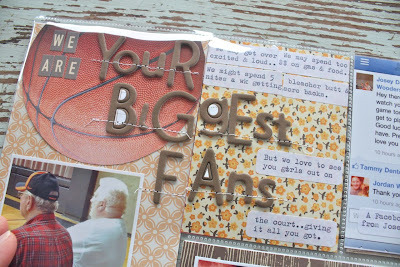 The big blank spaces allow for the stitched on chipboard letters which I love. 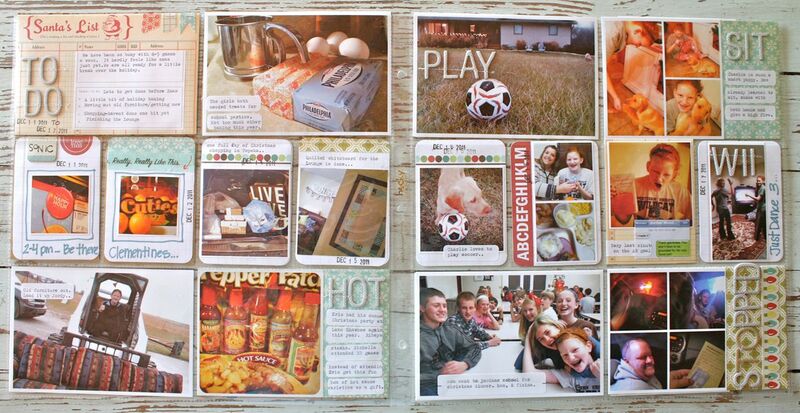 And here's my 12 x 12 spread with the inserts shown. 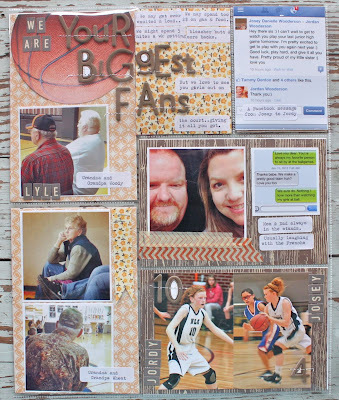 I used a 6 x 12 page protector and an 8.5 x 11 which has some simple school papers from the girls. 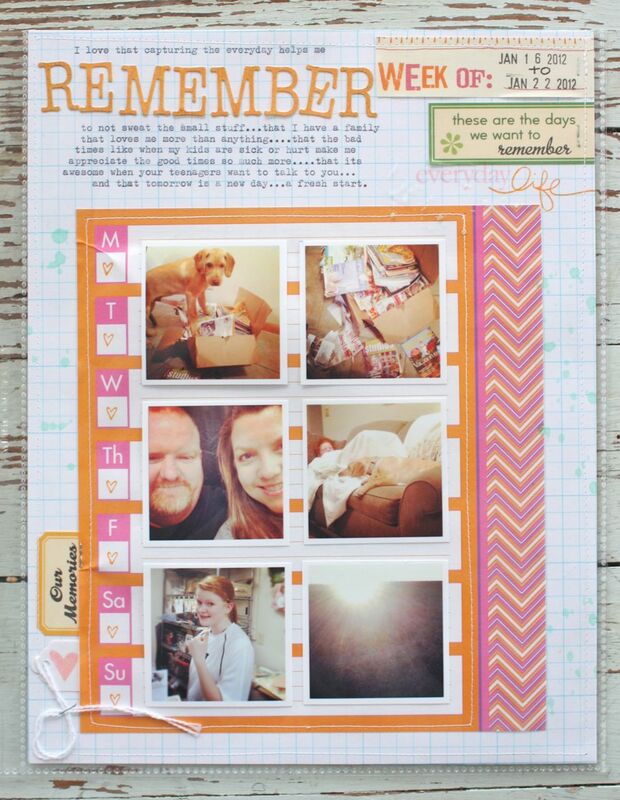 Here is a great tip and Ali Edwards does this too(along with many of you I'm sure): Any inserts that go in between the 12 x 12 weekly layouts are smaller than 12 x 12. 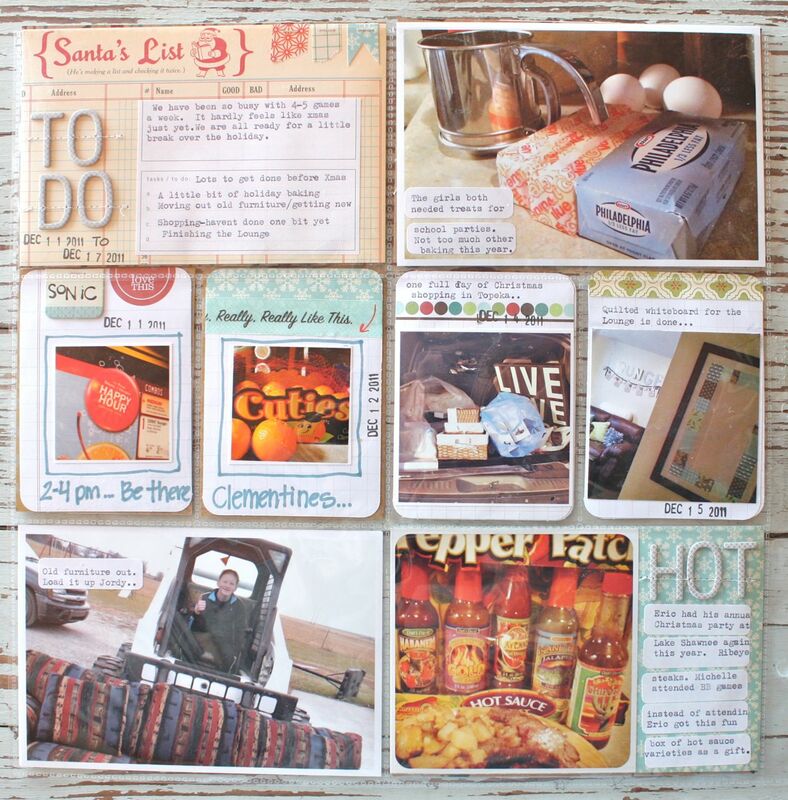 I feel that this helps showcase the main 12 x 12 layout + it tells that the smaller inserts are supporting stories. You always get a glimpse of the 12 x 12 pages from both the left and the right. 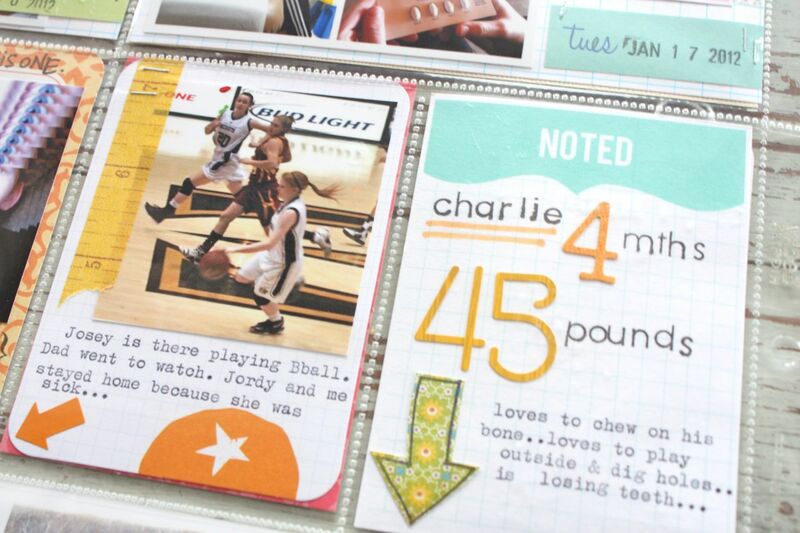 You can use regular inserts or trim down any 12 x 12 inserts that you choose. 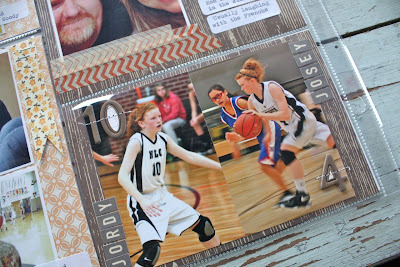 Or create a custom size by stitching around a photo or whatever you include in the insert, then trim around it. I just love the look of this. Here's my 6 x 12 insert which has a separate story on each side. I used papers from the 12 x 12 layouts to keep it all looking uniform. 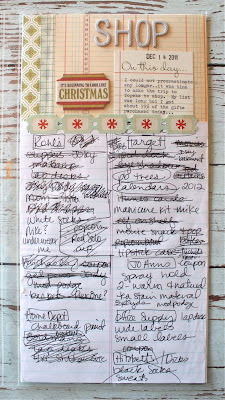 For this page I include my shopping list torn right out of my list pad. It coordinates with the photo in the main 12 x 12 page where I show the mother load of packages in the back of the blazer. And here's the back side of the 6 x 12 insert. 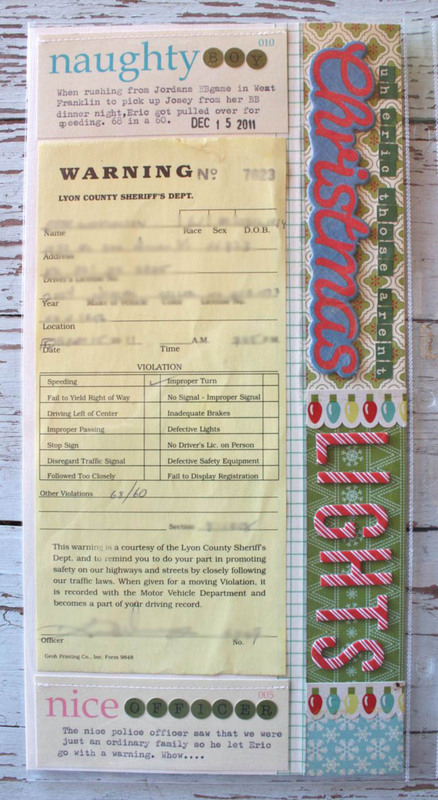 It features a not-so-fun but oh-so-real moment where Eric got a warning ticket for speeding. 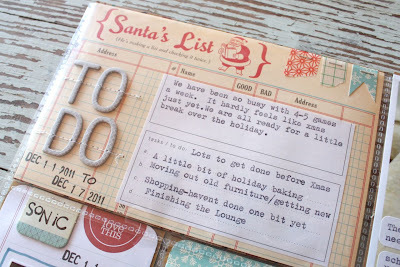 I love that I was able to use the 2 naughty/nice Elle's Studio cards for journaling, just perfect! 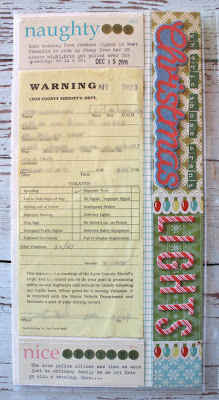 I have a 4 x 6 slot in the main 12 x 12 layout that shows Eric's face + the officer's lights. We were just talking about going and seeing the Christmas lights and I joked to Eric that these were not the kind of lights I was talking about, hence the vertical title on the right of the layout. I know this layout will be a fun one to look back on. You don't know how badly I wanted to ask the officer to "say cheeeeese" while poking his head in our window. Note to self: Keep the iPhone handy at all times. With that I'll sign off for today. I really hope you are enjoying the entire process of Project Life. Find your groove, capture those moments & stories and just roll with it. Your pages will change, will evolve into your own great style where it be very simple or very detailed. 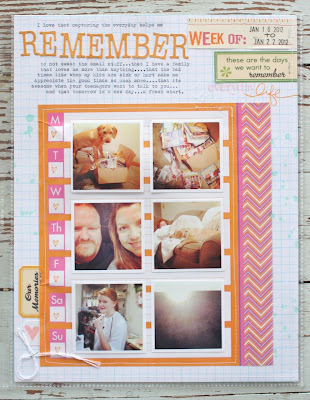 You will love to see your PL album fill with days and weeks of memories. I promise! I added some sacks and other items to the shop this week. Am looking forward to getting an Elle's Studio assortment of goodies to create some fun PL kits + I've found a great lineup of tags that I'll be offering soon...perfect for adding journaling to all your cards and layouts. I've got a few items left in my Etsy shop also if you're looking for the colored variety of tags.